A frantic search for a missing person in the Hudson River in upstate New York has been underway since early afternoon Tuesday. Ida Siegal reports. A frantic search for a missing person in the Hudson River in upstate New York that has been underway since early afternoon Tuesday has been suspended. 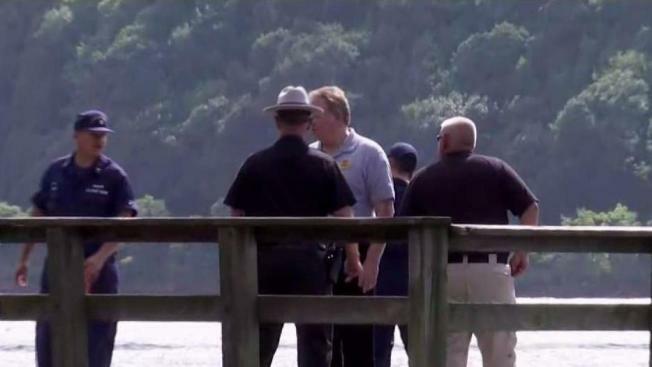 The search will resume Wednesday morning after city officials in Poughkeepsie, Dutchess County, told News 4 a multi-agency search is underway for an individual believed to be missing in the Hudson River. Divers are searching the water for the missing person and the U.S. Coast Guard is en route to take over the search, according to Poughkeepsie City Administrator Marc Nelson. Units were dispatched for five people in the water off the pier by the Rip Van Winkle apartments. The incident was reported around noon, in the area of 10 Rinaldi Blvd. in the city's downtown. According to authorities, a group of young adults were in the river when two encountered trouble, getting caught in the current. It was then that authorities were called to the scene. At least one person was taken to Mid-Hudson Regional Hospital in Poughkeepsie, according to Nelson. Their condition was not known. The swimmer is described as a 49-year-old man. Recreational swimming in the part of the Hudson River where the swimmer went missing is legal, but authorities recommend all swimmers to wear flotation devices if they decide to go in the water. The city's police and fire departments were at the scene, along with the county sheriff and state police. The search for him was suspended at 7:30 p.m. Tuesday, and police say it will resume Wednesday when the sun comes up.